March is over, so it’s that time to recap my 2013 collecting wishes. Here is the original 2013 wishes write-up if you need help understanding this post. Break the 365 post mark for the calendar year – In March I matched February’s total of 49 posts. However, I did put up a lot of want lists, but that’s mainly because work is killing me and I’ve had little time to do card research. Anyways, at this pace, I’m eying 641 posts for the calendar year, which vastly exceeds my goal of 365 posts. I dare say I expect this number to rise as the 2013 MLB Tournament proceeds and as I get my Fleer, Score, Topps and Upper Deck want lists up. Recognize and Replace Series that Just Aren't Working – Serial work is few and far between at the moment. With added stress from work and the ever-present lack of time, serial work is on the back burner. Hopefully I will be able to get back to it soon, even if it is not that popular. Follow Through! – Not sure why this is a 2013 Wish, but I think I’m doing a fair job of keeping the blog active. However, I need to think of more ways to make it interactive. COMPLETED - Follow Through! - Part II – Finally completed a trade that’s been gnawing at me since late 2011. I can sleep again at night. Trade, Trade, Trade – Made several trades in March with MrHaverKamp, Captain Canuck and Mr. Nelson. Have a few trades in motion as I type with Mr. Smith and 2 x 3 Heroes. As for the “net losing” cards promise I made to my wife, I thought I had safely obliterated that goal, but Mr. Nelson might tip me over the scales again. While I haven’t updated the counter recently, the cards sent is accurate, but the cards received is off by about 800. Complete 20 Sets – Knocked out two sets in March: 1988 and 1989 Donruss. I bet y’all are so jealous… That puts me at five completed sets for the year and 15 shy of my goal. Finish Uncle Doc's Card Closet – Phase I is completed, as is Phase II. As for Phase III, I have about 18% of my cards sequentially ordered, and in super-shoes with dividers. Slow and steady, and then I can start the electronic database! 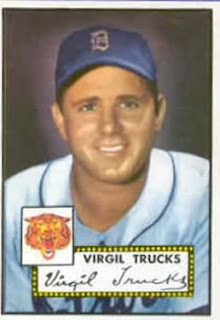 COMPLETED - Get my Hands on a 1952 Topps – Carl Crawford Cards sent me a beautiful 1952 Virgil Trucks card that has catapulted itself to the most felt, smelt and never-to-be-dealt card in my collection. I love it.